It’s here! The NBA All-star game is here! There’ll be dunks and passes and everyone will play defense like Kyle Korver! Kenny Smith and Reggie Miller will talk too much! Shaq might dance! And there’s a twist! Jackson is right. The current NBA climate has made a distinct transition to ‘small-ball’ with traditional players playing different positions, to create match-up problems for the opposition. While these teams appear to be using unconventional styles, their purpose is actually the most conventional part of the game, which is to create an advantage that the other team will struggle to cope with. Basketball really has none of these. Basketball positions were created because at some point, someone felt that constructing a team in a certain way would give their team the best chance to win and other teams copied them. There is no requirement to field any type of line-up; teams just always do, because they need to match-up well with their opposition. Basketball is completely about match-ups, both individually with players and stylistically, in terms of how teams play the game. 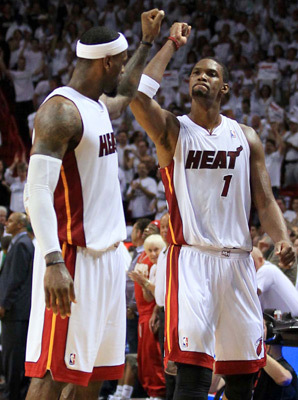 Bosh and James: Two players that have helped reshape the NBA landscape. The league champion Miami Heat, who have two unique positional players in LeBron James and Chris Bosh, and also lack a ‘true’ center, have been able to (or have been forced to, depending on how you look at it) play with several unique line-ups and did so with ultimate success in last year’s playoffs, which is the pinnacle of the ‘evolution’ that Stu Jackson mentioned. And as with anything, ultimate success creates imitators, with the New York Knicks, Oklahoma City Thunder, Denver Nuggets and Brooklyn Nets creating their own variations of the small-ball mentality. Some of those teams do feature ‘true’ centers and therefore their variations are only applicable to the other four positions on the floor; no other NBA team has the personnel that the Heat do, which makes them an incredibly unique team and is the primary reason they’re so difficult to defend. Some teams, namely the Memphis Grizzlies and Los Angeles Lakers, have gone the complete opposite direction. Both teams feature two elite big men. The Grizzlies have been quite successful, as Marc Gasol and Zach Randolph play complimentary styles and often beat opponents into submission. The Lakers have had more than enough press with their difficulties in integrating Dwight Howard and Pau Gasol, both of whom should likely be playing the center position, and would do so more effectively if they were on different teams. I thought it would be fun to discuss the different traditional positions in the NBA, as a precursor to the all-star game this weekend. I’m going to begin today with the center position and later in the week we’ll discuss forwards, and finally guards. The idea is to examine how the game is changing, and also to remember some fantastic players from past years. In addition, we’ll take a look at the best all-star performance or moment for each position. To discuss centers, we must first classify what types of centers are currently in the league. When we get to the other two types of positions, this is going to be a bit more difficult but with centers it’s pretty easy. Our true centers are traditionally the biggest men on the floor. The true center plays in the middle of the floor on offense and defense, blocks shots, gets easy dunks and is generally a monstrous nuisance for the opposing team. However, due to the size, speed and conditioning in today’s NBA, the true center is going the way of the dodo. Big men who succeeded in past simply because of sheer size are no longer fast or durable enough to play the modern game. However, a traditionalist mind-set prevails about true centers. If you can get a star center, most teams will take the chance, as they are the rarest of commodities. It’s the reason a player like Greg Oden (an injury bust to this point) was drafted over current league scoring champion Kevin Durant. It’s the reason Michael Olowakandi, a middling role player at best, was drafted first overall in 1998. It’s the reason Sam Bowie was drafted before Michael Jordan. 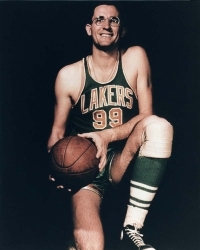 The NBA’s first true center was George Mikan of the Minneapolis Lakers. Mikan played for just seven years, beginning in the NBA’s inaugural 1948-49 season. At 6’10, 245lbs, Mikan would have been a formidable presence in today’s league; then he was a giant, who brutalized opponents physically. Mikan played in an era with no-shot clock and a much smaller key, which allowed him as much time as he wanted to beat his defender down and then receive the ball where it was easy for him to score. His sheer dominance led to four championships in his seven seasons, which is likely what led other teams to try and build around big men. Mikan: Once the most dominant player in the NBA. Wilt Chamberlain and Bill Russell took things to the next level, becoming towering superstars in a burgeoning league, with Wilt dominating individual statistics (setting records that still stand for both average points and rebounds in a season) for three different teams and Russell becoming the epitome of team success in Boston, winning ten championships and even acting as a player-coach for his final two seasons. Teams have been trying to find the next Wilt and Russell since Wilt and Russell retired. This led to the development of myriad elite centers, such as Moses Malone, Willis Reed, Bill Walton, Dave Cowens, Bob Lanier and Robert Parish, all game changing rebounders with offensive skill to spare. 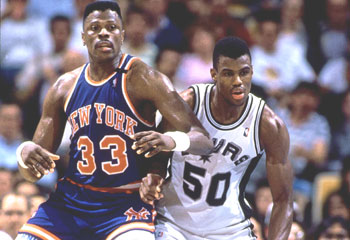 In the 1980’s and 90’s, as the game grew even more athletic, physical specimens such as Hakeem Olajuwon, Patrick Ewing and David Robinson took the position to a new level. These guys could not only perform the duties of a ‘true’ center but they were sublime passers who could handle the ball, block shots and wreak absolute havoc on the defensive end of the floor. Shaquille O’Neal emerged in the early 1990’s as perhaps the furthest physical evolution of the position; he was built like a regular man that was blown up with a magnifying glass. Even though he spent a lot of his career in the midst of controversies about his weight and/or issues with teammates, Shaq retired with four championship rings, a league MVP trophy, three finals MVP’s and sitting at fifth on the all-time scoring list (he has since been passed by Kobe Bryant). Extreme height is another way teams have experimented with the center position. Manute Bol, Gheorge Muresen, Shawn Bradley and Yao Ming all stood 7’6 or higher and all struggled to stay healthy throughout their NBA careers. Yao probably had the most success, becoming a household name and making several all-star appearances. Bol and Bradley were elite shot blockers who struggled with their coordination and strength, thereby making other aspects of the game difficult. Muresan stood 7’7 and his career was short lived due to health issues. He did however do this. The greatest center of all-time is a man who was completely inimitable. Lew Alcindor, better known as Kareem Abdul-Jabbar, is the NBA’s all-time leading scorer. Standing 7’2 inches tall (some say a conservative estimate), Abdul-Jabbar won six Championships and a record six league MVP awards. At the time of his retirement, Abdul-Jabbar was the NBA’s all-time leader in points scored, games played, minutes played, field goals made, field goal attempts, blocked shots and defensive rebounds. He also did this, this and this. A bygone era. Note the hair. So where does that leave us? Teams are constantly on the look-out for the next awesome offensive center, something that seems to be in scarce supply. The days when Ewings, Olajuwons and Robinsons were coming into the league year after year appear to have passed us by. Miami proved last year that you don’t need a true center to win, something that had been preached by offensive coaches such as Mike D’Antoni and Don Nelson for years, but also something that was never supported with an NBA championship. The evidence now exists. As with any position, we’ll need to split the current NBA crop of players into categories – complete players, offensive specialists and defensive specialists. I’ve also rated the players by all-star or sub-all star level. Some teams field a time-share principal at center, so there are instances of multiple players from the same team being listed. Some teams also don’t field a traditional center, something I’ll discuss later on but I’ve tried to include at least one player from each NBA roster. If a team has a starter who plays the majority of minutes but also has a second ‘true’ center on the bench, I’ve left the bench player out. So if we scan the list, we can see there are only six true all-star level centers playing in the game today (based on this season). Of those six, only two, Detroit’s Greg Monroe and Sacramento’s DeMarcus Cousins, can be called the undisputed best player on their team. Dwight Howard used to be the undisputed best center in the league and he probably still holds that belt, but he’s still the number two option on his own team, behind Kobe Bryant and with his recovery from back surgery limiting his mobility, he hasn’t been the dominant, explosive player that we grew accustomed to watching. All of these factors mean it’s a far cry from the past, when centers were the focal point of roster building and towering all-stars dominated the NBA. ‘Good question, friend!’ I respond. We’ll deal with them in our next piece, on forwards playing out of position, or in Gasol’s case, vice versa. Don’t worry little buddy! We’ll get there soon. I’ll leave you now with the best NBA all-star moment for the center position. In 2006, the Detroit Pistons were the toast of the NBA. They’d recently won a super-star-less championship in 2004 and had made the finals again in 2005, losing to the San Antonio Spurs. In 2006, their core four players, Ben and Rasheed Wallace, Rip Hamilton and Chauncey Billups, were all named to play in the all-star game. Flip Saunders, the coach of the Eastern Conference team, announced that at some point in the game, he would play all four of his Pistons together, to reward their ‘team’ play. Avery Johnson, coach of the Western Conference all-stars, announced to his team before the game that to combat this tactic, he was going to big. And he meant real big. For the first time in NBA history, Johnson fielded a line-up featuring five ‘seven’ footers. Kevin Garnett, Tim Duncan, Dirk Nowitzki, Pau Gasol and Yao Ming joined forces in the biggest line-up ever assembled. While Garnett is only listed at 6’11, he is widely believed to be at least 7’0, if not 7’1 and lists himself lower to avoid the stigma that comes with being a 7’0 player. This lineup featured a truly unique combination of size and skill and illustrates why position in the NBA is so fluid. That’s where we’ll leave things today. You may have noticed four of those seven footers listed above weren’t mentioned within our ‘true’ center discussion. That’s because none of them really are. On Wednesday, we’ll discuss the forward position and the unique characteristics that forwards bring to the game. We’ll also examine the state of forwards in the NBA and look at some of the best moments from forwards in the NBA all-star game.